“Welcome! 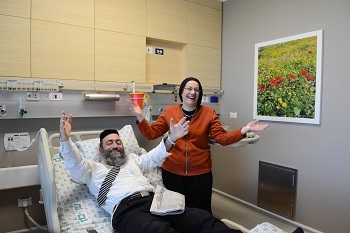 You are the First,” Nira Kedar, head nurse of the Hadassah Medical Center’s Neurology Department, said, with a huge smile, to Nachshon Halevy, the first patient to be wheeled into the new Neurology Department on the ninth floor of the Sarah Wetsman Davidson Tower Hospital. Earlier that day, the back-up systems for ventilated patients were checked, a few pegs were straightened, and some scuff marks were wiped away. Hadassah Rabbi Moshe Klein, together with Director General Prof. Avigdor Kaplan and Neurology Department Head Prof. Tamir Ben-Hur, had placed the newest Hadassah mezuzah on the Tower’s ninth floor portal of healing. “May Hashem (God) bless you in your everyday work of healing,” said Rabbi Klein to the staff. Mr. Halevy was one of 28 patients — some of them with ventilator in tow — to leave the four-decade-old neurology ward for this state-of-the-art facility. He had sought help at Hadassah when he found himself unable to keep one of His eyes open. It turned out that he had contracted a neural infection. “Because he has diabetes,” his wife, Orit, explained, ” he requires the expertise you receive at Hadassah.” She noted too: “We did not know that we would be moving into a luxurious suite. Wow! You have to feel better already just moving in here. ” Mr. and Mrs. Halevy , long-time Jerusalemites, are school teachers and the parent of seven children. Eventually, the neurology department will house 36 patients, being treated for a wide variety of neurological disorders. “The private and semi-private rooms — as opposed to rooms shared by six patients — allow us to focus on patient needs,” relates Prof. Ben-Hur. “The ability to prevent infection and to allow our patients total rest while still conducting high-tech monitoring will contribute to faster recovery.” In addition to this sophisticated monitoring, four of the department’s rooms are specifically designed for epilepsy patients and are equipped with a double monitoring system that includes both EEG and video capability.